Health is entirely a condition of mental, physical and social well-being that includes the sorrows and happiness. The overall situation of health is expressed by the attitude of movements. If someone looks healthy, but weak in movement means the man is not well all the way. The mental delightfulness is such type of invisible component that keeps mind healthy. On the other hand, the sorrows of mind expose the illness that is a sign of bad health as well. However, the state of a mind tells about the whole perspective of health definition. Therefore, the health can be defined as to the real condition of mental and physical state of a mind and body. We almost everybody knows that there are two aspect of health- Physical and Mental health. The both aspects incorporate reciprocally to depict the human state as a whole. The visible flesh-bone structure of a human body is called the physical health. The physical health is generally a result of intake food staff. The physical wellness depends on taking the nutritious foods. If a person takes good foods regularly, then his physical health will improve overnight. Otherwise, the exercise and regular activities that include the numerous movements also increase the physical health. In one word, that health takes noticeable changes in activity is called physical health. The physical health includes fitness of body, muscular strength, bodyweight, sexual behavior, cardio-respiratory, lever, kidney, abdomen and much many more organs. The physical health can be divided into two sections. 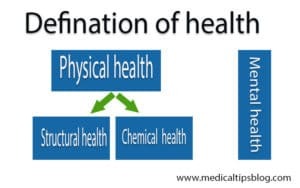 The definition of structural health has already been mentioned above. It is a structure of some organs and flesh-bone. The bonny skeleton is covered with flesh. And the several pieces of functional organs are inside the skinned body. The mental order of a man depends on the state of cognitive and emotional perspectives. If the mental order of a man performs well, then it is considered the man of a good state of mental well-being. The man with mental fitness is always balanced and stable in work or any other human activities. Therefore, the mental health of a man is necessarily important than physical health. Because the physically disordered man cannot instantly be risky. But a mentally disordered man, on the other hand, can be destructive in no time. The health definition can be described time to time while the mental and physical health are changeable. The mental health of a man can be changed in sequence of the changes of political, social, economical and global situations. On the other hand, the physical health of man can be changed by the variation of food habits. That is all the information of health definition.